In this article, we provide a setup your first cryptocurrency trading bot guide. Traders will understand how several bot options work, their pros & cons, as well as what to look for. Crypto bot setup choices discussed here are purchasable software, open-source projects, and self-programming. Before we continue, there are several aspects of cryptocurrency trading bots that investors should understand. Bots are tools that cannot predict human behavior. Thus, they should not “decide” on funding, money transfer and order release instead of its user. They may automate data analysis, as well as a signal user on market trends and behavior. Allowing freedom to a crypto bot may lead to the complete wipeout of your balance. Due to how the crypto market behaves, high volatility can mislead software into making bad choices. Thus, we advise our readers to always be active with the industry and make their own educated decisions, rather than leaving the work to a trading program. In this guide, we use Haasonline as a source of information. The Haasonline has several programs available, depending on a number of bits needed and license period. Usually, crypto software prices its products in bitcoins and Haasonline is no different. Head over to the platform and check out its pricing program, as seen below. 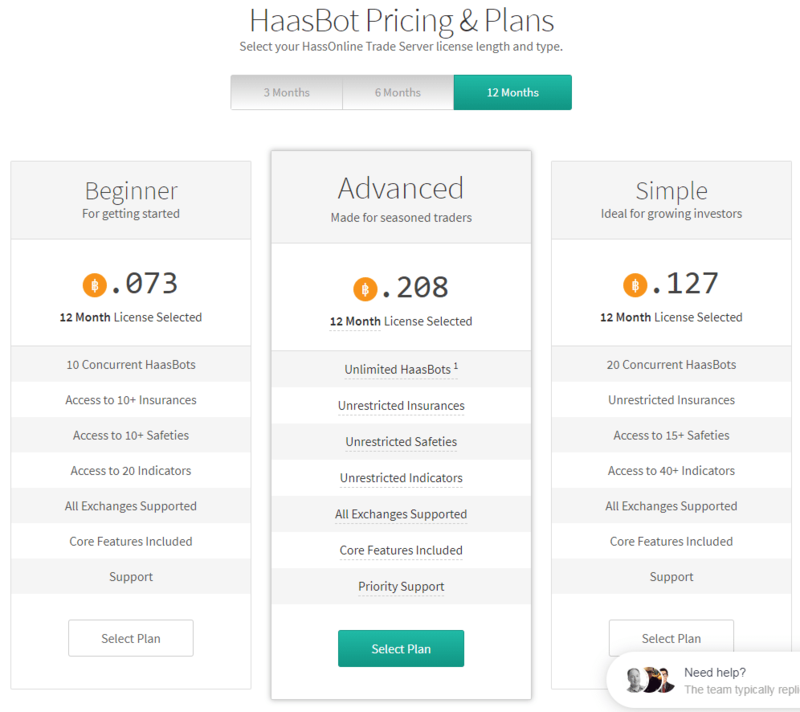 We recommend for starts the “Beginner” plan, as to familiarize themselves with how bots work. As you choose the plan, you get an address where you should transfer the indicated a number of bitcoins. This might take up to an hour for your transaction to be confirmed by the mining community. Once done, download the software and follow installation steps, as shown in the picture below. Once installed, open up the bot window and a picture like the one after this text will show up. Choose the exchange and commands you wish to go with at that moment and press “Save”. Voila! The whole process can take up to an hour and a half, including bitcoin transfer. Easy, isn’t it? If you have an IT flair within you, then you might want to go for a customized version of your cryptocurrency trading bot. Open-source projects leave users to develop their own thing or can use the existent code in its entirety. However, it does require your fair share of coding involvement. These are free to use, however, if you do not have knowledge of coding, you will need to hire someone that does. Below you can find the Gekko platform and how does an open-project look like. You follow the download and installation guides that are readily available at the Gekko’s website. Once installed, you can use Git software and tweak it by coding, as seen below. For complex operations, we would advise you to hire an expert if you have no experience regarding cryptocurrency trading bots. For those traders interested in dabbling in crypto bot coding, well, there is good and bad news. The good news is that if you hire a team of programmers, it can be done within a day or two. The bad news is if you wish to do it on your own, you need knowledge about coding languages, like Java, Python, C++, and others. Read about setup instructions from other developers on your chosen coding platform to get an idea about what codes are needed for the bot to properly run. Code the bot or hire a team to do it in your stead. Usually, average bots that tackle data form markets and signal you for changes (the simplest form of the crypto bot) can take weeks to develop. With over 400 lines of codes, you really need to know what you are doing to get it right. Use the bot after a painstaking month of work. Keep looking for improvements to getter better quality signals and data. In this article, we covered how to setup your first cryptocurrency trading bot. Due to the complexity of work involved with the last two options, we would recommend beginners to purchase bots. These are easy to understand, easier to implement and even easier to follow up. They may not be cheap to purchase nor is modification possible. However, it will get you started to understand how a crypto bot works.